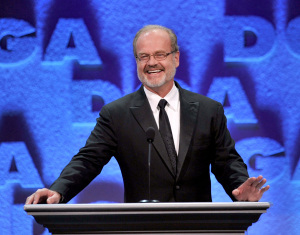 Director/actor/producer Kelsey Grammer will host the 65th Annual DGA Awards on Feb. 2, 2013. in the Ray Dolby Ballroom at Hollywood & Highland in Los Angeles. Grammer most recently voiced the character of the Tin Man in “Dorothy of Oz” and just finished acting in the feature film “Reach Me.” Both are slated for 2013. This will be Grammer’s second consecutive turn hosting the DGA Awards. Grammar’s also the guy who walked out on Piers Morgan’s show after he heard his intro because a prior wife’s name was mentioned. Tin Man indeed.